Lactose is a sugar found in milk and milk products. The small intestine—the organ where most food digestion and nutrient absorption take place—produces an enzyme called lactase. Lactase breaks down lactose into two simpler forms of sugar: glucose and galactose. The body then absorbs these simpler sugars into the bloodstream. Lactose intolerance is a condition in which people have digestive symptoms—such as bloating, diarrhea, and gas—after eating or drinking milk or milk products. Symptoms occur 30 minutes to 2 hours after consuming milk or milk products. Symptoms range from mild to severe based on the amount of lactose the person ate or drank and the amount a person can tolerate. In people who have a lactase deficiency, the small intestine produces low levels of lactase and cannot digest much lactose. In lactose malabsorption, undigested lactose passes to the colon. The colon, part of the large intestine, absorbs water from stool and changes it from a liquid to a solid form. In the colon, bacteria break down undigested lactose and create fluid and gas. Lactose intolerance is a common issue, which makes identifying the products that contain lactose important for avoiding symptoms. While most people know that cow's milk and products derived from cow's milk contain a large amount of lactose, many people question whether goat's milk and, by extension, goat cheese contain lactose. Goat's milk is thought to have slightly less lactose than milk from cows. Whether or not the amount of lactose is low enough to make goat's milk easier to digest for people with lactose intolerance is debatable and depends on the person. There is another reason that goat's milk might be easier to digest that has nothing to do with lactose. Goat's milk is naturally homogenized, meaning the fat globules are small and remain suspended in the milk rather than separating out. This makes the milk easier for humans to digest. In cow's milk, the fat globules are large enough that they can be hard to digest. 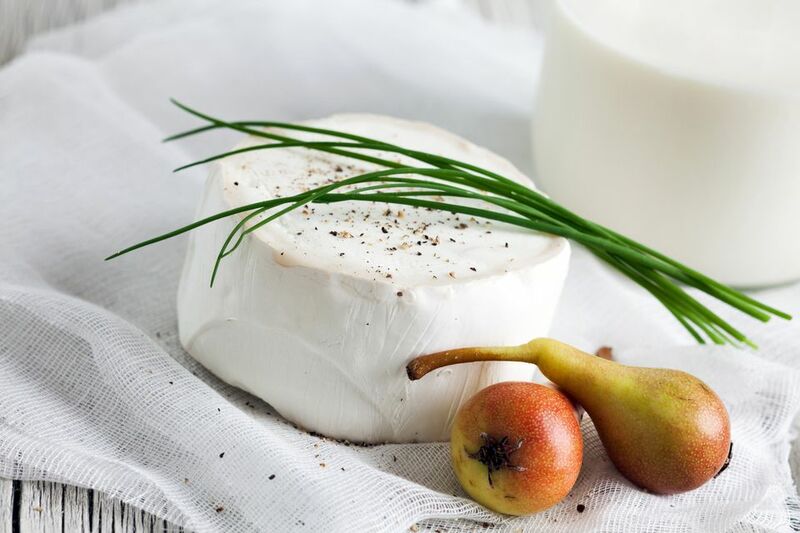 It's important to note that many types of cheese are naturally low in lactose or have non-measurable amounts of lactose, whether they're made with goat, cow, or sheep's milk. Most of the lactose is found in whey, which is the liquid that is separated from solid cheese curds during the cheesemaking process. As cheese ages, it loses even more whey. The longer a cheese has been aged, the less lactose will remain in the final product. Cheese with low or non-measurable lactose levels can be found in most cheese stores. Varieties include aged gouda, aged cheddar, parmigiano-reggiano, grana padano, mimolette, and romano. Regarding dairy allergies, there is a difference between being lactose intolerant and having dairy allergies. Typically, dairy allergies are an allergic reaction to the proteins found in dairy products. If a person is allergic to the milk proteins in cow's milk, it is likely they will be allergic to goat's milk as well. Is Goat Milk Healthier Than Cow Milk? Whatever Happened to Cottage Cheese?